Watch your favourite video songs and movies in video player. It supports DivX, XviD, MP4, WMV, H.263, H.264 file types. Blackberry Q10 is a qwerty touchscreen device with orthodox Blackberry outlook and gross weight of 136 grams, which makes it a really light weight smartphone. The device has a matte finish rear panel which is scratch resistant and gloss free. 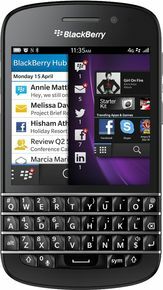 Q10 specifications highlight a Qualcom Snapdragon S4 quad-core processor with a clock speed of 1.5 ghz and 2 gb ram. It has an inbuilt memory of 16 GB which can be expanded upto 64 gb by a micro sd card. Blackberry Q10 battery is a removable 2100 mAh li-ion setup which enables 13.5 hours of 3G talktime and 345 hours of standby on 3G mode, as claimed by Blackberry. Blackberry Q10 is a great device in terms of its O.S. Q10 runs on the latest Blackberry10 platform, which is a swift way to cruise along on the go. This device seems to be a real comeback by Blackberry in the qwerty segment. The phone includes Bluetooth 4.0, wifi, supports 3G and some exclusive apps blackberry maps and BBM 6. Blackberry Q10, which sports an 8 MP autofocus primary camera with face-detection and flash by its side, can be purchased online at various e-commerce sites. Daylight pictures are crisp to the very finest delicacies of the photograph, and the pictures taken in low light are not bad too. The 8 MP camera is capable of 1080p video recording, which gives Q10 a head start in the race. The 2 MP front camera is a decent call for selfies in daylight. The 3.1 inch SUPER AMOLED display is an HD display with a resolution of 720x720 pixels and a multipoint capacitive touchscreen. The display is a pro and provides excellent visibility in daylight. To summarize the Blackberry Q10 specifications and details, Blackberry Q10 is an excellent device for Blackberry enthusiasts. The drawback remains to be the age-old user interface of Blackberry smartphones. But for those who prefer qwerty keypad, this is just the best option. Blackberry Q10 is priced in India at 21000 approximately. It’s a complete package filed with excellence in each nerve. For detailed price comparison, you can hit the e-commerce market. The Q10 is the first handset to sport a full QWERTY keyboard alongside the new BB 10 OS, but can it appeal to the wider audience? I was hesitant on buying a Blackberry, but went forward & bough it. I must say that it is the best QWERTY phone available in the market & very user friendly than Apple & Android phones out there. The looks are awesome & really unique. Screen is fantastic as well as call quality & audio quality from the speaker is superb. The only negative is the price at which it is priced. Its a wonderful piece of technology I must say. Thank you. If it comes out with the price mentioned here,then no one could stop BB in INDIA whatsoever...But to me,it seems like BB will place it around Rs.38k for sure...If it exceeds Rs.31k, then it will further loose its market share in INDIA..Recently by its flagship Z10 which is kept at 40k+ ruined its plan in increasing its market share... It should provide few budget smart phones around Rs.25k in order to shake the leading brands like SAMSUNG,NOKIA,SONY,hTC... I guess NOKIA had a good strategy for INDIAN customes. It had almost everything a smartphone requires.Price decides its fate. It would be better if had a quad core processor and for camera lovers like me it should have a dual LED flash.